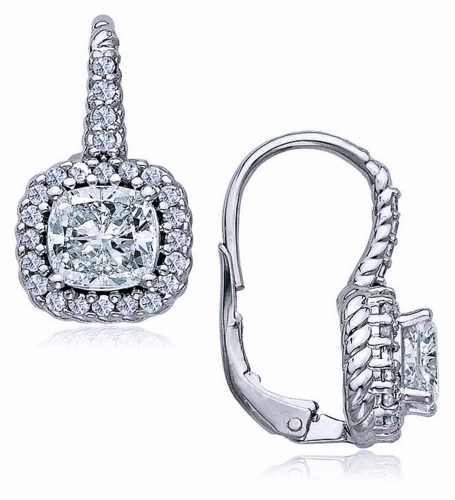 Our Calypso 1 Carat Each Cubic Zirconia Cushion Cut Pave Halo Twisted Rope Leverback Earrings are beautifully styled with the ever popular twisted rope design. 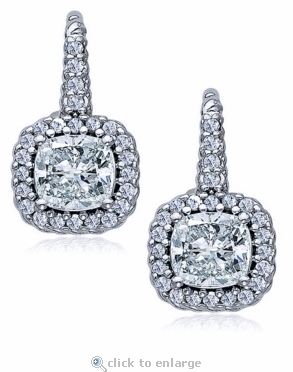 Each earring features an elegant 6mm cushion cut Russian formula center stone that is hand cut and hand polished to exact diamond specifications. A halo of pave set cubic zirconia stones highlight the cushion cut top quality simulated diamond center in addition to the top of the leverback. The twisted rope design beautifully enhances each leverback and adds the right touch of elegance. Leverback earrings are very comfortable to wear and are perfect for day to night. 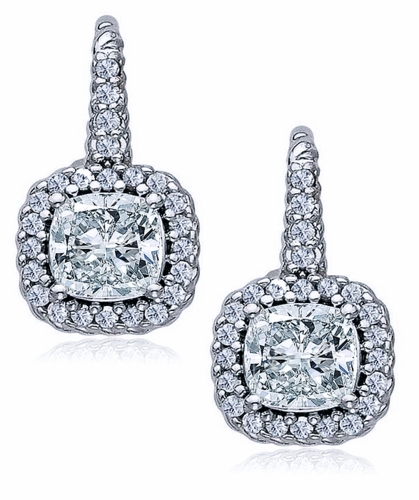 These leverback earrings include approximately 2.5 carats in total carat weight for the pair and measure approximately 19mm in total length and 10mm for the width of the entire halo. Center stone color options include diamond look (as shown), canary yellow, and pink cubic zirconia, in addition to man made ruby red, emerald green and sapphire blue. Choose from 14k yellow gold and 14k white gold, please see the pull down menu for options. For further assistance, please contact us directly at 1-866-942-6663 or visit us via live chat and speak with a knowledgeable representative.